In one of the first surprising moves of the NBA Draft, the Milwaukee Bucks drafted Australian Thon Maker with the tenth pick of the draft despite reports that some teams were concerned that he is older than he says he is. 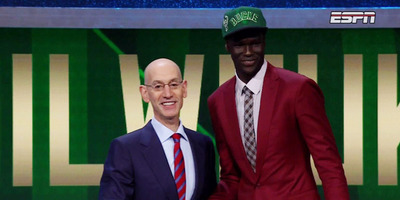 Maker is the first high schooler to be selected in the NBA Draft since 2005 when the NBA required players to be one year removed from their high school graduation. Maker successfully argued that he finished his high school coursework a year ago and that this past season at a school in Ontario was a post-graduate year. Maker, who is 7-foot-1, is listed as 19 years old. However, reports on Thursday said some teams were dropping him from their first-round draft boards over concerns that he might actually be 20 or 21. Maker is originally from Sudan, but his family left the civil war-torn country when he was four. He then moved to Australia for eight years, followed by three years in Louisiana, before moving to Canada at 17 years old.